I’ve never been much of a hiker before. I don’t mind walking and I don’t mind walking on trails and stuff, but what I do mind, is hiking on trails that have exposed sides. I get really nervous and am not very surefooted. That’s putting it politely. Actually, I’m terribly clumsy; add to that the nervousness from sheer edge trails and we have a recipe for disaster! 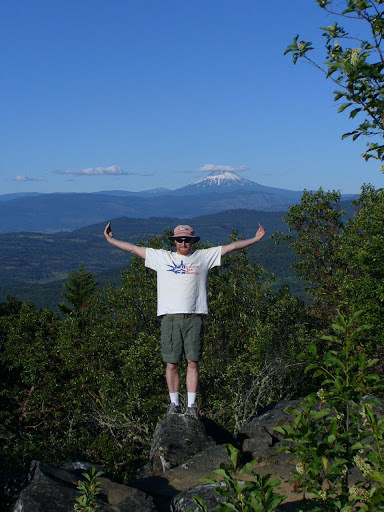 So, while we lived in Portland, and throughout my life, I have been on various hikes. 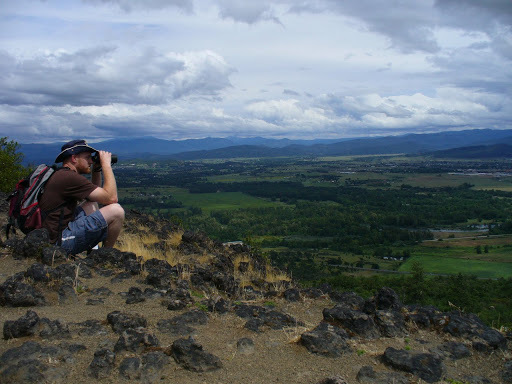 I have hiked up Beacon Rock east of Vancouver, Washington on the edge of the Columbia River, more than once. I have hiked up to the top of Multnomah Falls, once that I can remember for sure, but I’ve been to Multnomah Falls more than that, so it is likely I hiked it as a child as well. Chris and I did some hiking around Portland a couple of different times and places. 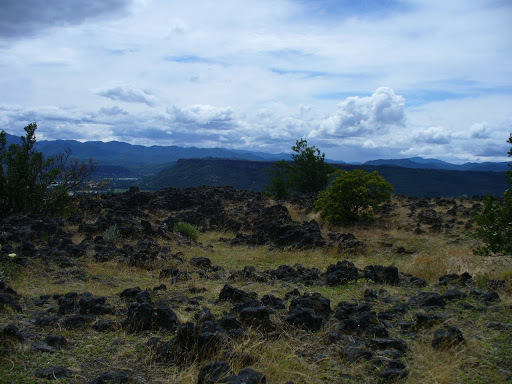 But it wasn’t until we moved to Southern Oregon that we have gone hiking multiple times in a short period of time. We have found a few places that are relatively close by, one is about 10 minutes from home, and another is about 20 minutes or so. There are several more that we hope to find time to check out this summer and fall as well. 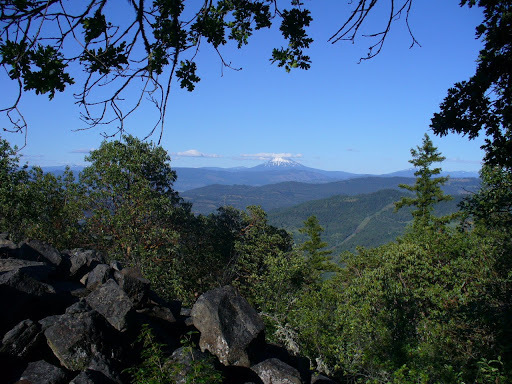 About two weeks ago we went hiking on Upper Table Rock. 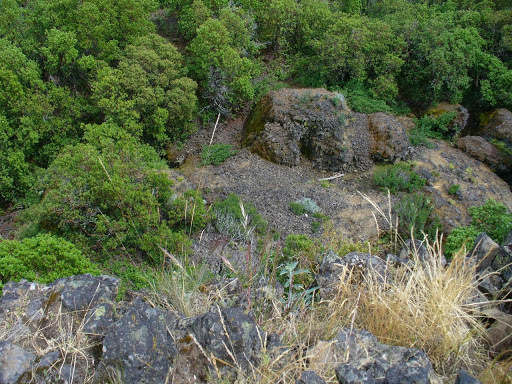 This flat topped rock was created by lava flows about 7 million years ago. 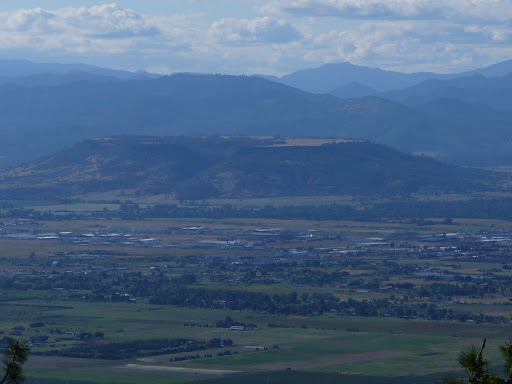 Upper Table Rock and its twin, Lower Table Rock, rise about 800’ above the valley floor. Up top they shift from rocky to grassy with seasonal ponds. I understand in the springtime they are quite pretty with all the different meadow wildflowers blooming. 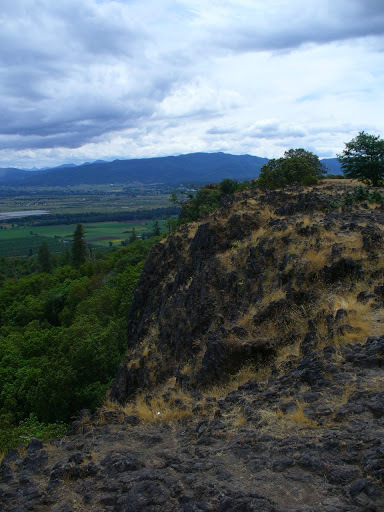 The hike to the top of Upper Table Rock is about a 740’ vertical climb. 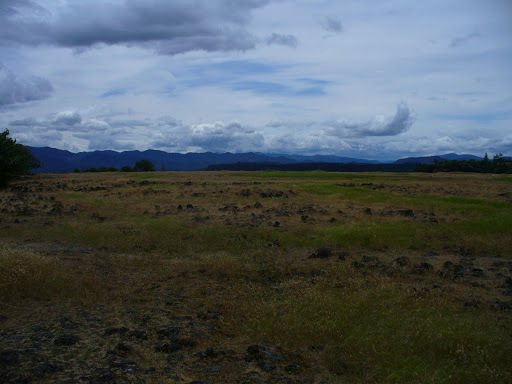 We forgot to check, but think it took us about an hour or so to reach the plateau. 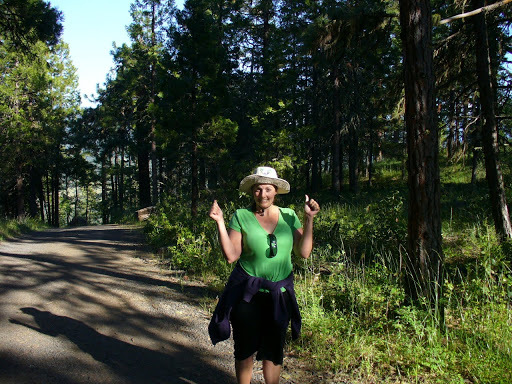 We were surprised that the trail, mostly gravel or hard packed dirt, was not muddy after the few days of rain we had experienced prior to our hike. The weather had been sunny when we decided to go for the hike. As we got in the truck to head to the trailhead it sprinkled a little bit. We were very lucky though. 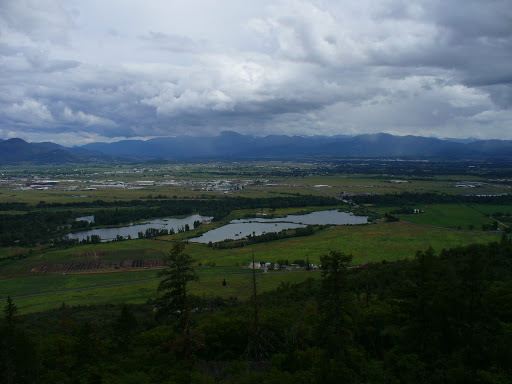 Even though you can see the rain hitting the foothills of the south valley and even some of the south valley floor, we never got rain and in fact, it was quite sunny and warm up on the plateau. The hike is pretty darn steep, with a significant climb in elevation. The bottom section starts off pretty steep, no nice gentle slope to get you started. In the middle, the trail flattens a bit, giving a false sense of ease. As we approach the plateau-summit, it gets pretty steep again, and also quite rocky. Throughout the trail, though, there are no significant edge drop-offs, so I am quite comfortable along the whole trail in that regard. Looking off the side from the top. Those are not bushes, those are the tops of trees! The first time we hiked up this trail was last fall. I was out of shape and unprepared. It was BRUTAL! I was huffing and puffing and my legs were burning and I seriously wasn’t sure if I could make it. This time, I am much more in shape and prepared. I hiked to the top without much trouble. Of course, it was steep so I was breathing heavily, but I managed to keep up with Chris the entire way and thankfully, all the working out I’ve been doing paid off. My legs felt great and I had enough energy and power to keep going. When we got back to the truck I was pleasantly sore and tired, but not painfully so. It was a great hike! Enjoy some photos of our view. 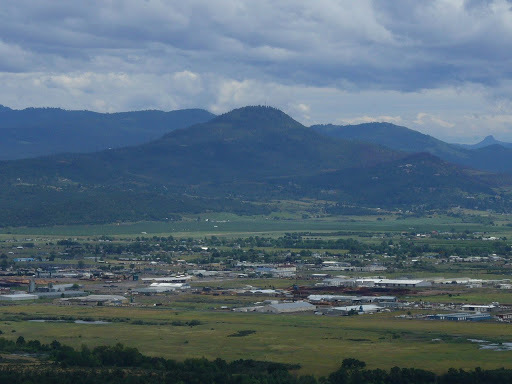 The next hike we went on was to the summit of Roxy Ann Peak. 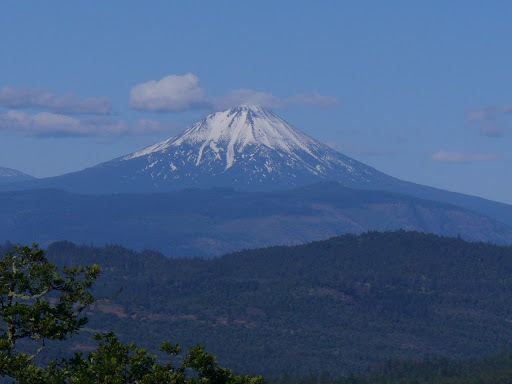 Roxy Ann Peak is a small mountain located directly east of my house. When I look out my back windows or sit on my patio, I look at Roxy Ann. Roxy Ann summit is at about the 3500’ level. My house is at about the 1500’ level. It takes us about 10 minutes to get to the gate where the hike starts on Roxy Ann. The hike we did is basically up the west side of the mountain, curved around to the east side and then up to the summit. This is all a gravel road hike. The mountain does have several other single track style trails on it, but we have not attempted those yet. The first time we went to Roxy Ann, Chris’ pager went off after about 15 minutes, so we had not gotten very far before we had to turn back. The second time we got quite a bit farther, but it was an after work hike, we still needed to have dinner and I had homework to do, so we cut it short as well. This time, we went prepared. I packed us dinner of skinless breaded fried chicken and homemade coleslaw and plenty of water. Chris got home a few minutes early and we took the quick trip to get to Roxy Ann. This time, it was the summit or bust! 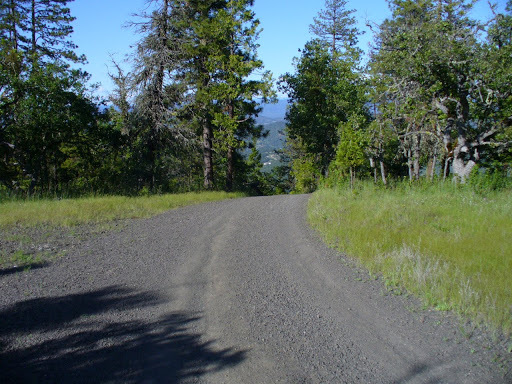 According to Wikipedia, Roxy Ann road is a 2.64 mile loop that goes all the way around the peak, and there are 6 trails that range in difficulty from moderate to steep. We did not do the entire loop, as on the east side of the mountain there is an additional road that heads up to the summit. We hit the road at the upper gate and set off at a brisk pace on a sunny, although somewhat cool and breezy afternoon. 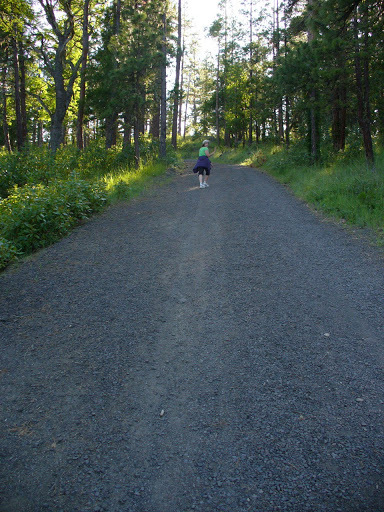 The first ¾ of the hike has a nice, relatively gradual climb to it. It is a nice workout, but nothing terribly strenuous. As we wound our way up the road we came to a point where we were on the north side of the peak looking north. 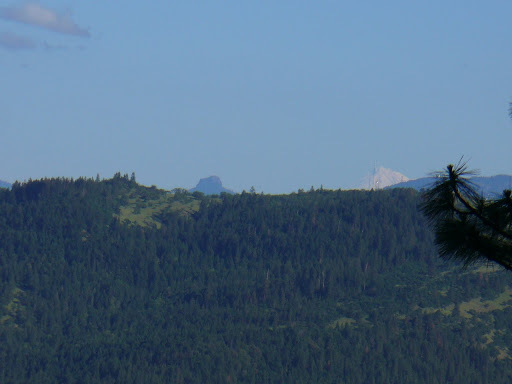 From there we could see the two table rocks off in the distance, where we had been hiking the weekend before! Cool! After this point, we start curving around the east side of the mountain. All of a sudden the road becomes this ridiculously steep grade! Seriously, as soon as we started up this last ¼ of the hike, I immediately fell behind Chris by 5 or 6 paces. It was that steep! Up – Up – Up! Man oh man was I feeling the muscles in my glutes and thighs! I was sweatin’, my heart was pounding and I was huffin’ and puffin’! I actually had to stop a couple of different times to get some water and try to catch my breath a bit. This is so much steeper than it looks! Truly! We finally reached the summit! I was so excited! I was so thankful to not be climbing anymore! I did it! It only took us about 55 minutes (including a couple of photo stops) to reach the top! 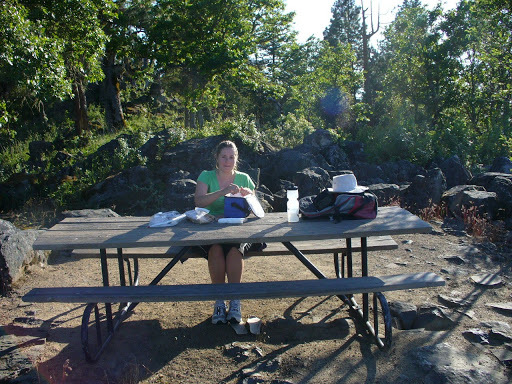 Also, totally awesome, there is a picnic table at the summit, looking east to Mt. McLaughlin. This is where we ate our chicken dinner. We made the descent after our dinner in about 45 minutes. It was a gorgeous day, a great hike, and awesome workout and I am looking forward to doing it again soon! 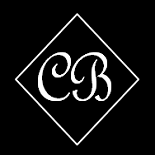 This entry was posted on June 17, 2010 by Corrie Beebe in adventures.